Parsley is a biennial herb, forming a dense rosette of leaves in the first year and flowering in its second year. There are three distinct types of parsley. 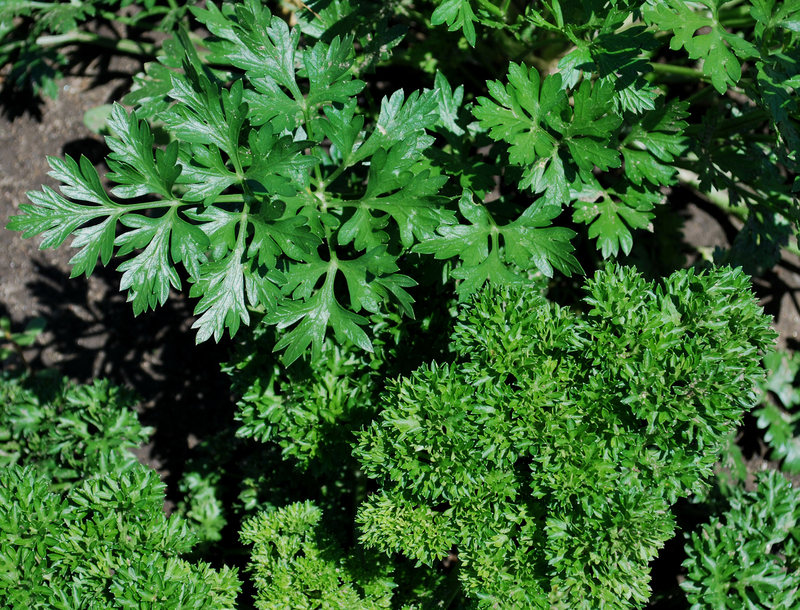 Probably the most familiar is curly parsley, followed by the Italian flat-leaf and the Hamburg or turnip rooted parsley. Curley parsley is used mostly as a garnish or in salads, the Italian flat-leaf is used in cooking, and the Hamburg is grown more for its delicious tap root than its leaves. Parsley plants prefer full morning Sun to partial shade. The herb is grown from seed and may take up to 3 weeks to germinate, so be patient. Use a high quality seed starter mix, moisten it well, and sprinkle the seeds on top. Don’t cover the seeds. Mist the surface of the soil daily, and keep the pots or flats in a warm area. Parsley seed will rot in cold, damp soil. Plan on allowing the little plants to grow in the same containers they were started in. All parsley plants have a long tap root and dislike being transplanted. I start my seeds in 6 inch pots. Three or four seeds per pot. I don’t thin them out, and they do well in crowded containers. Water the plants several times each week during summer. If the soil is allowed to dry out, the plants will flower and the leaves will become bitter. Place watering trays under the bottoms of the planters. During extreme temperatures of 90+ or more, fill the trays with water at least three times a week. The plants will absorb the water from the bottom of the trays. Water also on top if the surface soil feels dry. Parsley loves fertile soil, and will reward you with dark green and delicious leaves. Parsley is rich in vitamin C and A, and 1/2 cup of parsley has five calories ! Toss chopped parsley in salads, soups, stews, pasta sauces and baked potatoes. For best flavor, use it fresh. Rise and shine with the Summer Solstice on June 21, at 6: 51 A. M. – ET. On this day, dark and light are equal, 12 hours of each. Time to plant vegetables, beans, herbs, flowers, set out small pepper and tomato plants for a fall harvest. Remember to give the birds water and seed. Keep the birdbath full of fresh water.